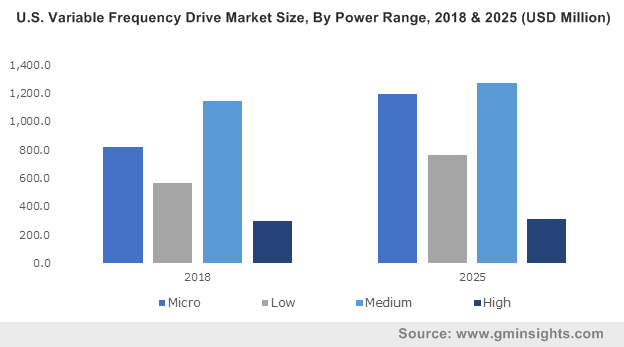 Over the past few years, the global micro combined heat and power (CHP) market space has depicted remarkable growth owing to the outcomes of government mandates aimed at decarbonization of the economy and tackling climate change. The adverse impact of fossil fuel based transport systems coupled with industrial pollution are the most significant factors to have compelled governments across the globe to rely on renewables. Numerous countries have come up with a strict regulatory framework along with incentive programs to support alternative and more efficient energy sources, essentially fueling the micro CHP industry share expansion. While elaborating on the measures currently being undertaken by major economies around the world, it would be prudent to take note of the recently modified Combined Heat and Power (CHP) Act of Germany. In line with the stricter regulations, the new CHP act supersedes the Renewable Energy Sources Act of 2000 and focuses on revamping the highly-efficient CHP facilities across the country. Through this act, the owners of CHP systems would receive incentives for the electricity generated via their co-generation facilities. Moreover, the new act intends to push electricity generation from CHP facilities to a commendable 100-terawatt hour (TWh) per annum by 2020 and 120 TWh by 2025, indicating the humongous growth potential of micro CHP market in the nation. YANMAR America introduced a new EPA certified 35 kW micro CHP systems in 2016. Powered by natural gas, the CP35D1 and CP35D1Z models are 88% more efficient than the conventional power facilities. Especially, the CP35D1 has a built-in inverter instead of external inverters which makes it a true plug-and-play unit. With decreased carbon footprint, the new micro CHP system also operates like the previous 5 and 10 kW CHP systems from YANMAR. Improvements in installation, simplification of exhaust system, higher heat recovery efficiency, and reduction in the overall package size are amongst the many pathbreaking features of the newly launched micro CHP systems. The leading manufacturer of micro combined cooling, heating and power generation equipment M-TriGen Inc., recently unveiled three new models of its trigeneration product range. Apparently, the new models have received authorization by Intertek and an ETL label which is a testimony to its higher performance and compliance with recognized safety standards. The new CHP systems have been specifically designed for government, military, light industrial, commercial, and residential applications. Moreover, the new models are equipped with gas heat pumps that enable customers to reduce peak load power requirements and save significantly on their electric bills. The indoor CHP systems installed 10 to 20 years ago are being replaced with new systems in the recent past. 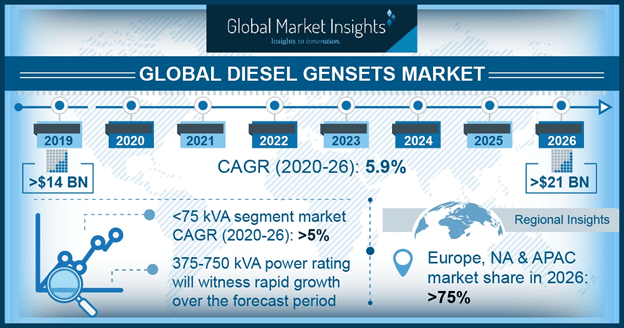 Therefore, the demand for co-generation systems that have better energy saving performance and are easy to transport has witnessed a remarkable rise. Needless to mention, the launch of the aforementioned high-grade and enhanced micro CHP systems that are well-suited for healthcare facilities, restaurants, hotels, offices or multi-unit housing has been instrumental in impelling the growth prospects of micro CHP industry. Owing to the proactive measures and initiatives being rolled out by various governments across the globe, the micro CHP market is slated to witness an annual installation of more than 3 GW by 2024. In addition to this, the growing deployment of sustainable energy technologies along with improvements in micro cogeneration systems would boost the commercialization scale of micro CHP industry in the forthcoming years. This entry was posted in ENERGY, MINING, OIL AND GAS and tagged Micro Combined Heat and Power Industry, Micro Combined Heat and Power Market, Micro Combined Heat and Power Market Analysis, Micro Combined Heat and Power Market Growth, Micro Combined Heat and Power Market Outlook, Micro Combined Heat and Power Market Pdf, Micro Combined Heat and Power Market Price, Micro Combined Heat and Power Market Report, Micro Combined Heat and Power Market Share, Micro Combined Heat and Power Market Size, Micro Combined Heat and Power Market Trends. 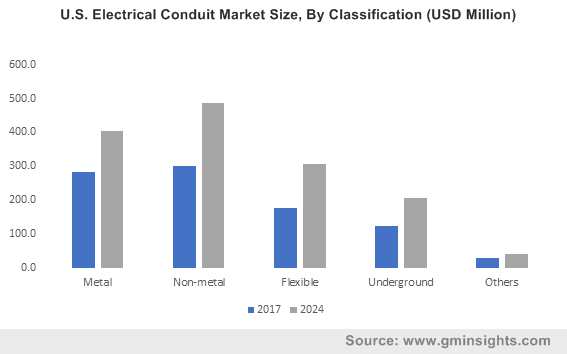 The global electrical conduit market, in the past few years, has witnessed a remarkable escalation in terms of revenue share owing to the extensive revamp of ageing grid infrastructure across developed and emerging economies. Increasing emphasis on installing energy-efficient distribution networks and the integration of varied frequency transmission networks have been instrumental in stimulating the growth prospects of electrical conduit industry, which commanded a total valuation of over USD 5 billion in 2017. Sensing the dire need to install sustainable grid networks, government and private institutions have been investing heavily in electrification programs – a factor that has further intensified the pace of industry share expansion. In addition to this, the deployment of smart control networking technologies along with improved on-site electricity generation schemes have drastically enhanced the product demand across various residential and commercial applications. In fact, as per a research report compiled by Global Market Insights, Inc., the residential and commercial applications together accounted for more than 50 percent of the worldwide electrical conduit industry share in the year 2017. A favorable regulatory framework across various geographies is expected to assist the residential and commercial applications segment to keep up the pace of growth in the near future. Growing inclination toward clean energy coupled with massive investments in the renewable sector have necessitated a complete overhaul of the existing grid infrastructure across major economies. In this regard, Asian countries have taken the lead in reforming their respective power sectors by launching a number of effective programs, essentially stepping up the commercialization potential of electrical conduit industry in the region. Moreover, various new initiatives are being rolled out to electrify far-off areas and rural hinterlands in the emerging countries of Asia Pacific. With the resolve to provide energy access to un-electrified rural and urban households, the Indian Government launched Pradhan Mantri Sahaj Bijli Har Ghar Yojana ‘Saubhagya’ in 2017. The ambitious scheme aims to attain the objective of universal household electrification throughout the nation, especially the underserved and unserved rural and urban pockets. With a total outlay of INR 16, 320 crores, the initiative intends to electrify nearly 300 lakh households across India. The state-owned power distribution companies (DISCOMs) in the nation are known to be financially distressed for years. This has reduced the overall operational efficiency and aggravated the crisis of power losses in the distribution network. To tackle these challenges and work toward financial and operational turnaround of DISCOMs, the Indian Government had unveiled the Ujwal DISCOM Assurance Yojana (UDAY) in 2015. Needless to mention, such reformative programs aimed at changing the power scenario in the nation have propelled the regional electrical conduit industry in the recent times. Given that the smart grid networks are increasingly gaining prominence across industrial peripherals, China has proposed humongous projects to modernize its energy infrastructure. As per its three-stage plan, the Asian powerhouse had announced that it would invest USD 240 billion between 2016 and 2020 to incorporate smart grid technologies. As the world’s largest electricity consumer, the three-stage plan would assist the nation in meeting its escalating electricity demand which is anticipated to double over the upcoming decade. Moreover, the Chinese government has been focusing on revamping the power distribution infrastructure across major industrials regions which would fuel the growth potential of electrical conduit industry in the country. Concurrently, the leading companies manufacturing electrical conduits such as Zekelman, ANAMET, Cantex, Wienerberger, Electri-Flex, Champion Fiberglass, Mexichem, Legrand, Hellermann Tyton, Atkore, Astral, Aliaxis, Hubbell, Schneider, and ABB have been concentrating on developing products equipped with highly-efficient technologies and expanding the current facilities to ensure economies of scale, essentially boosting the revenue graph of electrical conduit market. This entry was posted in ENERGY, MINING, OIL AND GAS and tagged Electrical Conduit Industry, Electrical Conduit Market, Electrical Conduit Market Analysis, Electrical Conduit Market Growth, Electrical Conduit Market Outlook, Electrical Conduit Market Pdf, Electrical Conduit Market Price, Electrical Conduit Market Report, Electrical Conduit Market Share, Electrical Conduit Market Size, Electrical Conduit Market Trends. The U.S. energy storage market share has been surging year on year as renewable energy utilization comes to the forefront replacing fossil fuel energy sources. According to experts, energy storage can become a market disruptor as it is fast emerging as a new technology with enhanced capabilities and cost saving that no incumbent technology can even begin to approach. As a result, energy storage capacity across the U.S. seemingly surpassed 1,000 megawatt-hours in 2017, which is a record in itself and has nearly doubled in 2018 adding another 1,000 megawatt-hours of capacity. The U.S. energy storage market is anticipated to continue its exponential growth graph as storage continues to get cheaper, out-competing other resources, as a sea of change is registered in the mix of resources that run the power grid. Recent instances of contracts signed in the U.S. such as the NV Energy in Nevada and Xcel Energy in Colorado have also helped in furthering the prospects for U.S. energy storage industry. While NV Energy has made it to the headlines with a contract to build 1000mega-watt of solar energy with 100 mega-watt of storage, Xcel Energy has set a new solar-plus-storage record with a median price of $36 per hour which is lower than the cheapest PV-plus-battery power-purchase agreement till date by as much as 20%. Many other such developments are in the pipeline that will allow solar production to extend past sunset and into the evening when demand peaks, making it competitive in respect to energy supplied by natural gas or fossil fuel resources. Not only lowered cost for renewable energy resources but also state policies will also contribute towards the deployment of energy storage systems and consequently the expansion of U.S. energy storage market, with more batteries being installed in homes, businesses and along the power grid. A fact that deserves special mention is that the U.S. home energy storage in 2018 witnessed more deployment than the front-of-meter storage deployment in the last quarter of the year. According to the U.S. Energy Storage Monitor the residential segment led the way in energy storage deployment, growing tenfold year-over-year. Concentration for residential deployment of energy storage systems have been most noticeable in two states, namely, California and Hawaii, which have together accounted for 72% of megawatt-hours in the last quarter of 2018 while Massachusetts with its new SMART program and Arizona, is expected to see some new tariff structures, and is a key contender for the third spot in the residential segment of U.S. energy storage market. The U.S. energy storage market has received a major boost from the fact that storage system costs have decreased roughly by two thirds over the last five years while more states have mandated utilities to procure storage systems. As consumers have come to realize that pairing batteries or energy storage with renewable energy projects improves reliability of power supply without creating greenhouse emissions, more homeowners and businesses are showing preference for power with backup energy storage and the option to capture and store excess energy produced in rooftop systems which can later be utilized after sundown, or when the wind is not blowing. 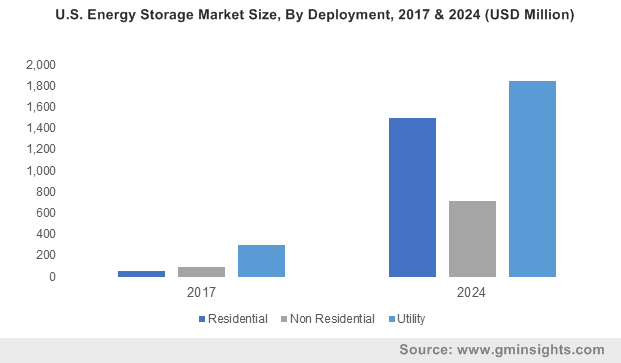 With large storage systems for utilities capturing a major portion of the U.S. energy storage industry and more utilities including storage in their solicitations for solar projects, U.S. energy storage market is expected to witness robust growth over 2018-2024. The U.S. energy storage market has been evaluated to amount to $4 billion by 2024 – a commendable upsurge from the $400 million worth in 2017. This entry was posted in ENERGY, MINING, OIL AND GAS and tagged U.S. Energy Storage Industry, U.S. Energy Storage Market, U.S. Energy Storage Market Analysis, U.S. Energy Storage Market Growth, U.S. Energy Storage Market Outlook, U.S. Energy Storage Market Pdf, U.S. Energy Storage Market Price, U.S. Energy Storage Market Report, U.S. Energy Storage Market Share, U.S. Energy Storage Market Size, U.S. Energy Storage Market Trends. ABB recently grabbed headlines in the global oil filled transformers market for its development of a robot for internal inspection of oil filled transformers. Apparently, the TXplore robot designed by ABB can work inside the complex environment of oil filled transformers and carry out internal inspections, a task which is rather costly and dangerous to humans. Downtime during human inspection of oil filled transformers not to mention the risk it poses to the human team as well as the cost to operator can be effectively reduced and, in some cases, entirely eliminated with the use of the TXplore. Application of the TXplore for inspections will not only mean lowering inspection times but will significantly contribute towards the expansion of oil filled transformer market as the product will become more easier to maintain. The oil filled transformer market is expected to register a major upsurge as the global population will continue to grow while economic advancements will increase the demand for electric energy around the world. According to the World Energy Council, global demand for energy per capita will reach its peak in 2030 and demand for electricity will double by 2060 which will lead to greater infrastructure investments and major upheaval of the current systems to promote energy efficiency. The United Nations estimates that the world population will reach 8.5 billion by 2030. With increasing innovations and the use of electronic gadgets becoming more widespread and common, it is expected that there will be an exponential demand for electricity which is turn will add a substantial impetus to the oil filled transformer market. It is noteworthy to mention that global electricity demand witnessed a 3.1% jump in 2017 and India and China together accounted for 70% of this rise, according to the International Energy Agency. Economic growth, widening of electric grids, rapid urbanization and expanding demand for electronic devices besides the huge population have contributed to the increase in demand for electric energy. The Agency cites that in China warm summers and robust economic growth of over 7% has contributed towards the growth while in India, 12% economic growth has done the same. These countries also have the largest population in the world. The oil filled transformer market is expected to register massive growth across the emerging economies, where energy demand is rapidly swelling. Speaking of the emerging economies such as India and China, it is imperative to mention that these countries would also be the seat for urbanization. According to another United Nations report in 2014 54% of the world’s population lived in urban areas, a proportion that is expected to reach 66% by 2050. Over the same timeline the world will be adding 2.5 billion people to urban areas with Asia and Africa consisting of 90% of the population. Pervasive electric supply is an essential element of urbanization and with the extensive supply of electricity, oil filled transformer market will register significant progress. With urbanization boosting the demand for electric supply, city planners are looking for greener and more efficient solutions which has led to the gradual rise of smart grids and an over hauling of the existing electric grid system. While cities like New York and New Jersey are in the process of building microgrids to support the mass transit systems, French public lighting firm, Citelum, has announced projects for smart street lighting. Older cities where the electric grid system is already established but out of date, are witnessing major upgradations not only to make newer technologies available to the city but also to install greener solutions which will eventually contribute to a greener future for the world by increasing energy efficiency and mitigating energy loss during transmission. With urbanization and increased population that demands better electric facilities, a robust path of growth will be paved forward for the oil filled transformer market over 2018-2024, which is expected to exceed $45 billion by 2024. This entry was posted in ENERGY, MINING, OIL AND GAS and tagged Oil Filled Transformer Industry, Oil Filled Transformer Market, Oil Filled Transformer Market Analysis, Oil Filled Transformer Market Growth, Oil Filled Transformer Market Outlook, Oil Filled Transformer Market Pdf, Oil Filled Transformer Market Price, Oil Filled Transformer Market Report, Oil Filled Transformer Market Share, Oil Filled Transformer Market Size, Oil Filled Transformer Market Trends.